Easily run network tests composing multiple well-known benchmarking tools into aggregate, repeatable test runs. Explore your test data through the interactive GUI and extensive plotting capabilities. Combine and aggregate data series and produce publication quality graphs. Capture metadata from local and remote hosts and store it along with the plot data. Collect secondary data series such as CPU usage, WiFi, qdisc and TCP socket statistics and plot it with the main dataset. Specify batch experiment runs to completely automate your testing regime. 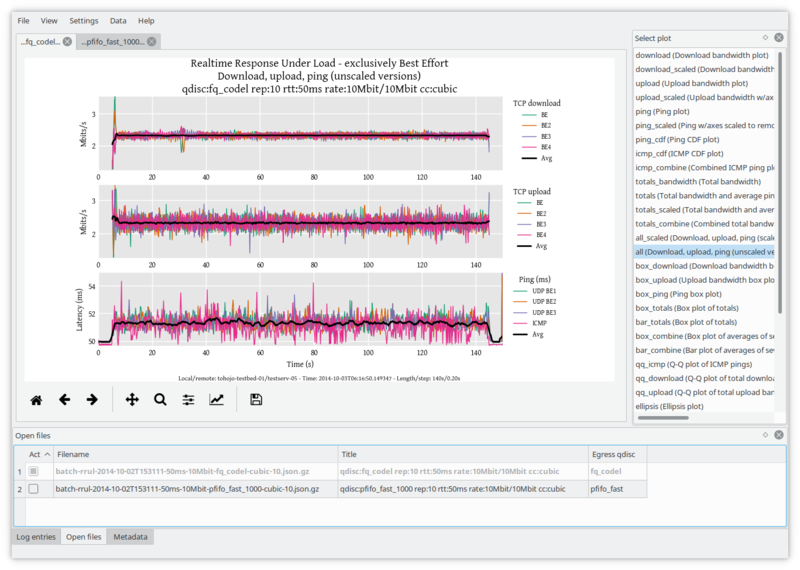 Flent is written in Python and wraps well-known network benchmarking tools (such as netperf and iperf) into aggregate, repeatable tests, such as a number of tests for Bufferbloat. There's a short paper (pdf) and a blog post describing some of the design goals of Flent. Install Flent as per the instructions below, then see the Quick-start section to get going. For more information, see the full documentation or search for specific content. Debian and Ubuntu: apt install flent. To install netperf, enable the non-free repository. Ubuntu pre-18.04: Add the tohojo/flent PPA. Arch Linux: Install Flent from the AUR. FreeBSD: pkg install flent to install the package or cd /usr/ports/net/flent to install the port.